Rather than throw out leftover whey from making cheese, re-purpose it to water and fertilize plants. Whey contains 6 to 7 percent milk solids, as well as several nutrients needed for plant growth. Plants will still need regular water, but watering with whey is a good supplement to fertilizers and it can improve soil conditions for plants that prefer a low pH. 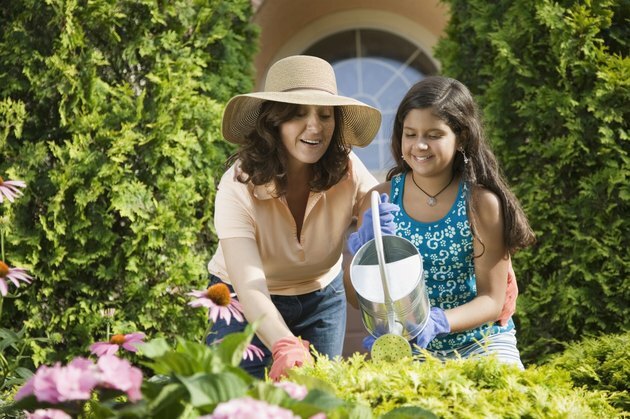 Mother and daughter watering plants. The exact nutrient content of whey varies, but 100 gallons of typical whey contains 1.22 pounds nitrogen (N), 0.40 pounds phosphorus (P), 1.46 pounds potassium (K), 0.29 pounds calcium, 0.05 pounds magnesium, 0.42 pounds sodium and 1.00 pound chlorine. The nutrient content of fertilizers is typically expressed in an N-P-K ratio, showing what percentage of the fertilizer's weight is made up of nitrogen, phosphorus and potassium. A gallon of whey weighs a little more than 8 pounds, so whey has a very low N-P-K ratio of about 0.15-0.05-0.17. There is little danger of over-fertilizing if whey is the only fertilizer used, but plants receive more balanced nutrients if whey is used with another fertilizer. If amounts of whey are properly balanced with other fertilizers, whey can help stabilize soil and supply trace minerals like calcium and magnesium without increasing the levels of soluble salt in the soil. This is an important attribute of whey since soils high in salt are toxic to plants. Salt buildup in the soil is typically caused by over-fertilization, and this danger is minimized when whey becomes a supplemental fertilizer. As a liquid fertilizer, whey can be substituted for regular applications of garden fertilizer. Application rates are determined by the amount of nitrogen. An all-purpose fertilizer with an N-P-K ratio of 24-8-16 is diluted at a rate of 1 tablespoon per 1 gallon of water. This supplies 0.1 ounces of nitrogen, 0.03 ounces of phosphorus and 0.06 ounces of potassium per application. To apply the same amount of nitrogen using whey, mix the whey half-and-half with water. This will supply 0.1 ounces of nitrogen, 0.04 ounces of phosphorus and 0.12 ounces of potassium per gallon. Use the mixture in place of regular fertilizer every other time you fertilize. Use 1 gallon of diluted fertilizer or whey per 10 square feet of garden space every seven to 14 days. Because whey is acidic, with a pH between 4.0 and 6.1, it can be used to correct pH in soils too alkaline for specific plants. Cottage cheese whey is the most strongly acidic, so it's the most effective at lowering pH. Soils high in calcium carbonates cannot grow acid-loving plants such as azalea (Rhododendron spp.) unless the pH is lowered. These plants prefer a soil pH of pH 4.5 to 5.5, so watering them with whey not only supplies needed nutrients but also provides a healthier pH. Azaleas are hardy in U.S. Department of Agriculture plant hardiness zones 4 through 9, depending on the variety.